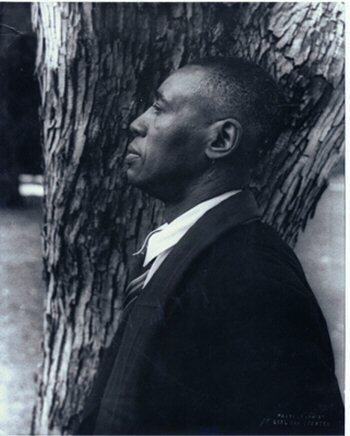 Horace Pippin, a soldier in World War I and later a painter, was born on February 22nd, 1888 in West Chester, Pennsylvania, but his family moved to Goshen, New York when he was three. His grandparents were slaves, and his parents worked as domestics. Pippin attended public schools and therefore segregated schools while living in New York. By the age of 10, Pippin became disenchanted with school and left to work menial jobs. When World War I began, Pippin quickly enlisted with the all-black 15th New York National Guard Regiment which was renamed the 369th Infantry Regiment when it arrived in France in 1918. Pippin fought in the war with his unit, and was awarded the Purple Heart for the injury he received. He was shot and crippled in his right shoulder by German soldiers. Pippin later remarked that the war supplied him with the inspiration and imagery that allowed him to paint. After returning to the United States, Pippin married a widow, Ora Jennie Featherstone Wade, and together they returned to West Chester, Pennsylvania. Pippin worked odd jobs including in an iron foundry and helping his wife deliver the laundry she did. He sometimes sang in a choir. Eventually, Pippin began exploring art. In 1929, he began work on his first painting, which would consume three years. By holding small paint brushes in his right hand, and guiding the wrist with his left, Pippin painstakingly applied paint to the canvas. He also did wood burnings by applying a hot poker to wood panels. In 1937, Horace Pippin entered two of his painting in a local art show and quickly began to gain attention. At the height of his career he produced about four paintings a year. Pippin’s paintings were displayed in prominent galleries in New York City. After a one man show in 1940, Pippin’s fame skyrocketed. Unfortunately, this fame was accompanied by a decline in his personal fortunes. His wife suffered a breakdown and spent the rest of her life in a mental institution; the loneliness drove Pippin to heavy drinking which probably took his life. On July 6th, 1946, Pippin was found dead in his bed in his West Chester home. His paintings remain popular American folk art, notable because of Pippin’s line use and flat shapes, and because he lacked any formal training.